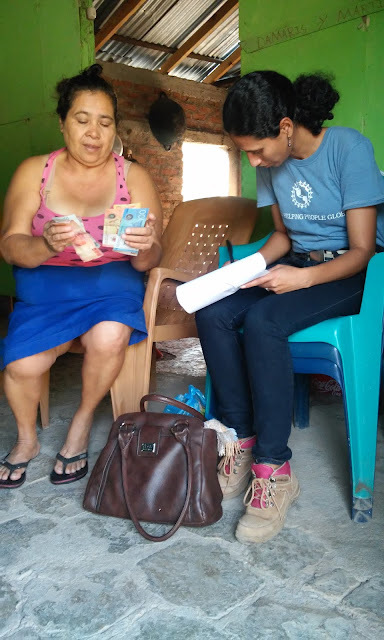 Last Saturday we visited our clients in Soledad de la Cruz, small rural community located on the highway between San Isidro and Leon around 30 miles from Matagalpa (10 miles from hydroelectric power station Carlos Fonseca). This neighborhood is growing incredibly fast which is not surprising considering that a new big house here costs between $3.000 and $5.000. Every time we come to Soledad de la Cruz (once a month) there are a couple of new houses which weren’t there last time. In this community we count with 2 groups, 9 clients in total all of them women who sell secondhand clothes, Avon cosmetics, and mobile phone’s refills, make pastry or sew dresses among other. This time we visited group leaders who handed us in last payments and we gave them application forms for new loans in return. Most of clients reach for their second or third loan from People Helping People Global in amount of $180 or $250.